We are raising £14,871 through crowdfunding to allow us to continue running our support programme for teenagers. Our funding for the programme runs out at Christmas. Through out the year young people have been coming to our beautiful Fishbourne site. 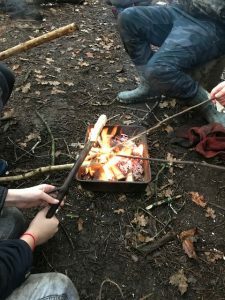 Our experienced team of forest school leaders and our counsellor have been working to build self esteem, confidence and wellbeing. The young people have been greatly benefitting from the session which is impacting on all aspects of their life including impacting on their ability to access education. Please make a small pledge to our project (or a big one) and share our project with your friends and colleagues. We have a longing way to go and every bit counts!! !